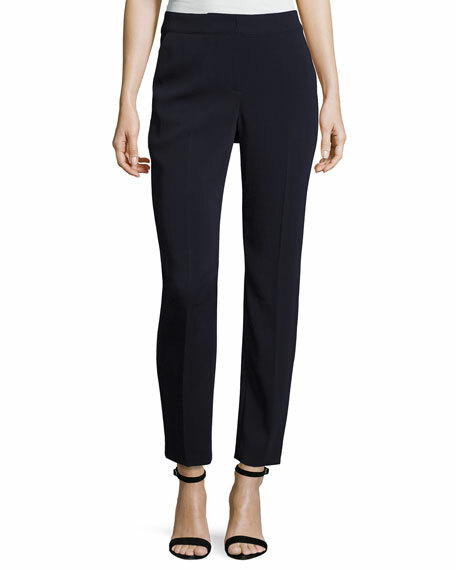 St. John Collection "Emma" classic stretch pants. Approx. 38.5" outseam, 28" inseam. St. John is an iconic American brand founded in Southern California by Bob and Marie Gray in 1962. Today, St. John is a global luxury brand offering a lifestyle collection for the modern woman. St. John is recognized for its updated classics and chic, effortless, enduring style. AMO Denim camo-print pants. Elasticized waistband. Side slip pockets. Fitted through straight legs. Cropped above ankles. Pull-on style. Linen/Tencel® lyocell. AMO Denim camo-print pants. Elasticized waistband. Side slip pockets. Fitted through straight legs. Cropped above ankles. Pull-on style. Linen/Tencel® lyocell. Made in USA of imported material. Model's measurements: Height 5'10"/177cm, bust 33"/84cm, waist 25.6"/65.2cm, hips 35.8"/91cm, dress size US 2-4/FR 34-36. Eileen Fisher stretch-jersey slouchy pants. Mid-rise; elasticized waist. Relaxed, tapered legs. Cropped at the ankle. Faux cuffed ankles. Organic cotton/spandex. Eileen Fisher stretch-jersey slouchy pants. Mid-rise; elasticized waist. Relaxed, tapered legs. Cropped at the ankle. Faux cuffed ankles. Organic cotton/spandex. Made in USA of domestic materials. Model's measurements: Height 5'10"/177cm, bust 33"/84cm, waist 25.6"/65.2cm, hips 35.8"/91cm, dress size US 2-4/FR 34-36. 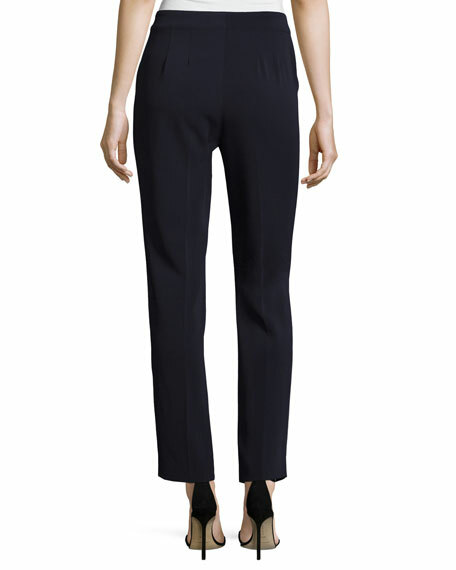 Eileen Fisher jersey stretch-knit pants. Flat front; covered elastic waistband. Straight legs. Cropped above ankle. Curved leg hem. Pull-on styling. Eileen Fisher jersey stretch-knit pants. Flat front; covered elastic waistband. Straight legs. Cropped above ankle. Curved leg hem. Pull-on styling. Organic cotton/spandex. Machine wash. Made in USA of imported material. Model's measurements: Height 5'10"/177cm, bust 33"/84cm, waist 25.6"/65.2cm, hips 35.8"/91cm, dress size US 2-4/FR 34-36. Piazza Sempione "Audrey" capri pants. Approx. measurements: 10" rise; 25.5" inseam; 35" outseam (size 44). Natural rise. Slim fit through straight legs. Cropped above ankles. Slit at back cuff. Virgin wool/spandex. Made in Italy. Model's measurements: Height 5'10"/177cm, bust 33"/84cm, waist 25.6"/65.2cm, hips 35.8"/91cm, dress size US 2-4/FR 34-36.